Many people will remember the Nokia 1610 as their first mobile phone. It was Nokia's second budget digital phone, after the 2010, and the first to be more than a stripped down version of a business phone. The 1610 was a neat stylish phone engineered for the consumer market. The 1610 was one of the phones that helped change the mobile from Yuppie toy to consumer product. However, when it was launched in 1996, mobiles were still owned by only 10% of the UK population. This was a similar figure to the number of people that had a landline phone in the 1960s. The 1610 had a similar look and feel to Nokia's business phone, the 2110, but had fewer features. There was no SMS on the original version, so users could not send texts. At the time it was not considered a hugely important feature for a consumer phone; my, how times have changed! However, its big selling point was an amazing 200 hours standby time. Previously people had to recharge phones every day, now they could go a whole week without having to worry about the battery going flat. The Nokia 1610 fitted neatly into Nokia's existing range of digital phones, in between the very basic Nokia 2010 and the top line business phone, the 2110. Unusually for Nokia, the 1610 took a full size SIM card. 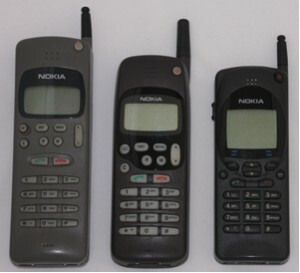 The 1610 was available on Cellnet and Vodafone, on One2One as the Nokia 1620 and on Orange as the Nokia 1630. You could get one of these for as little as £4.99 from Cellphones Direct on Vodafone PersonalWorld. However, they charged a connection fee of £35 and £17 monthly rental charge (1). Nokia took the battery life feature a stage further when they introduced the Nokia 1611 which had a solar power option. These phones are quite common. So you should be able to get one for around £10 on eBay. Look for examples with chargers, because they did not have most common type of Nokia charger and are quite hard to source now. These phones share a charger with the 8110 and 3110. They have a smaller pin than the most common type of Nokia charger. However, be careful with this information as Nokia seems to re-use these numbers for later phone chargers which will not fit. Unlike more recent phones the 1610 were single band GSM phones, so the 1610 will only work on 900Mhz i.e. O2 or Vodafone. The 1620 and 1630 variants, in theory, should work on T-Mobile and Orange 2G networks respectively, but I have not tested it. (1) The Guardian, 27 August 1996, display advert. "Ts,he phone that is pictured first on the left is NOKIA 2010 I believe. Nice phone! I borrowed one from my cousin and used it for few months. After that he needed it back and l found another phone NOKIA 1610. At the end of Y2K I was using NOKIA 3110.